The crew of the Rocinante may be approaching its final adventure — Syfy has cancelled "The Expanse" after three seasons. Updated May 15: Fan campaigns to save "The Expanse" are being compiled on Reddit. Syfy has canceled its sweeping space epic, "The Expanse," after three seasons. The TV network will air its last "Expanse" episode in July, according to a report by Deadline.com, but the show's production company, Alcon Television Group, plans to shop the series to other networks. 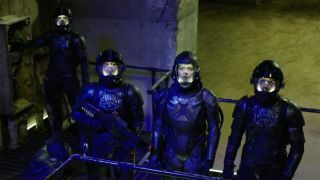 "'The Expanse' transported us across the solar system for three brilliant seasons of television," Chris McCumber, the president of entertainment networks for NBCUniversal Cable Entertainment, which includes Syfy, told Deadline.com. "Everyone at Syfy is a massive fan of the series, and this was an incredibly difficult decision. We want to sincerely thank 'The Expanse's' amazing cast, crew and all the dedicated creatives who helped bring James S.A. Corey's story to life. And to the series' loyal fans, we thank you most of all." Deadline.com suggested that the decision could be tied to the show's viewership; Syfy has the rights to only the first-run television airings of the show, whose views have been declining from season to season. "That puts an extraordinary amount of emphasis on live, linear viewing, which is inherently challenging for sci-fi/genre series that tend to draw the lion's share of their audiences from digital/streaming," Nellie Andreeva wrote at Deadline.com. "We are very disappointed the show will not be returning to Syfy," Alcon Entertainment co-founders and co-CEOs Andrew Kosove and Broderick Johnson told Deadline.com. "We respect Syfy's decision to end this partnership, but given the commercial and critical success of the show, we fully plan to pursue other opportunities for this terrific and original IP."